Developing a cheerful disposition can permit an atmosphere wherein one’s spirit can be nurtured and encouraged to blossom and bear fruit. Being pessimistic and negative about our experiences will not enhance the quality of our lives. 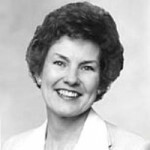 Barbara Ann Woodhead Winder was the eleventh general president of the Relief Society of The Church of Jesus Christ of Latter-day Saints from 1984 to 1990. Barabara Woodhead was raised in East Millcreek, Utah. She attended several years at the University of Utah before marrying Richard W. Winder. In 1982, Winder accompanied her husband to California, where he presided over the California San Diego Mission of the church.